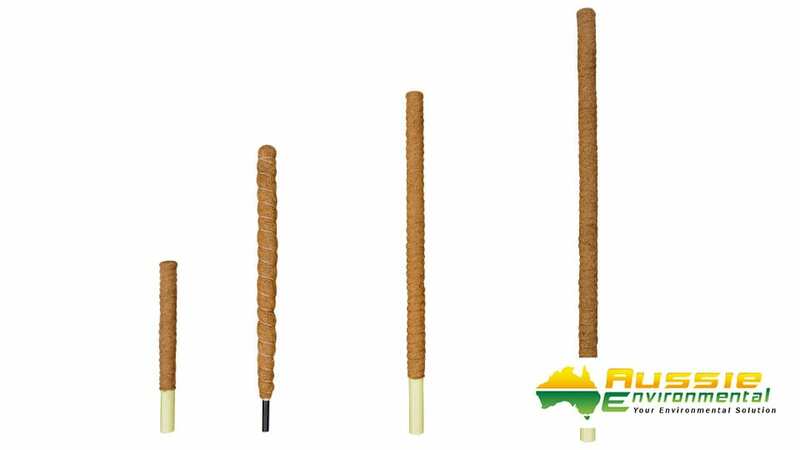 Aussie Environmental specialise in a range of coir based and biodegradable garden supplies. 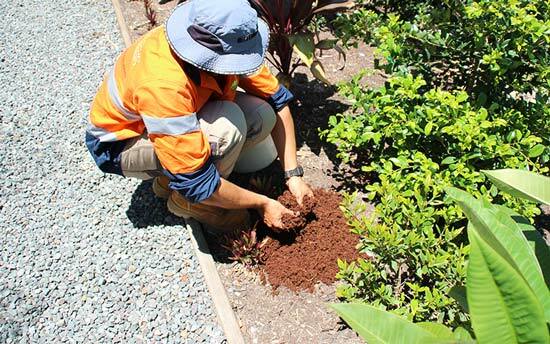 We’re a big believer in biodegradable and renewable products by providing a range of eco friendly products for erosion control, landscaping, revegetation and gardening. Let’s take a look at some of our garden products below and how they can benefit your home garden. Aussie Environmental also sell a natural soil less hydroponic medium call Coir Mulch or Coir Peat. If your looking to increase your hydroponic growing results coir mulch may be what you are looking for. It’s stated as an excellent hydroponic growing medium, has an ideal pH ranging from 5.5-7, holds 22% air even when fully saturated and has excellent drainage properties. Coir mulch never cracks shrinks or crusts and also aids in suppression of fungal growth. Being made from coir it is completely environmentally friendly and made from a 100% renewable resource. Coir mulch holds 6-7 times it weight in water with each 5kg block expanding to 60-75L in size. Check out our video of the just one single block expanding out to fill a wheelbarrow. 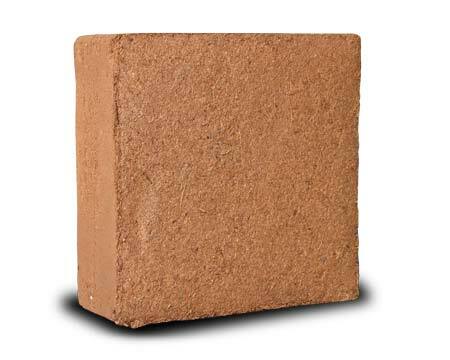 Aussie Environmental sell coir mulch in blocks of 5kg and 15kg pack specials, we can also sell in bulk if you are requiring a large amounts. Help suppress weeds with our 100% biodegradable jute products. Aussie Environmental provide plastic and organic weed suppression products. Aussie Environmental will always prefer organic biodegradable products for your garden rather than plastics. 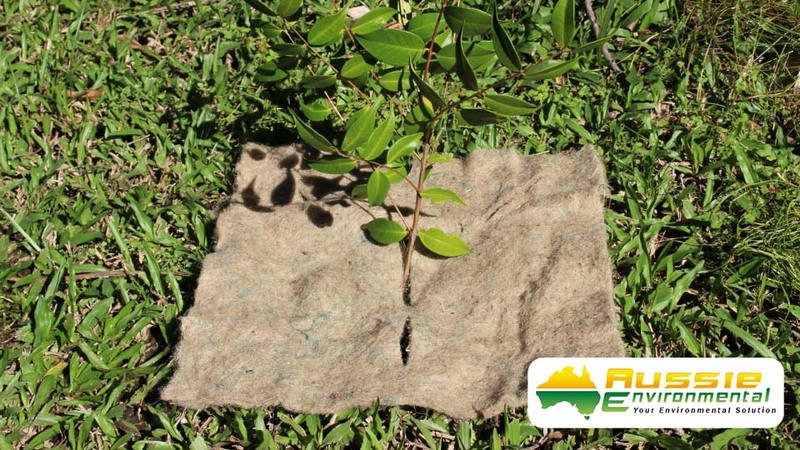 Our jute matting and jute squares are a great alternative to plastic weed suppression products. Not only do these products suppress weeds they do not contain any plastics which can break apart into smaller pieces. Plastic weed mat will eventually break down into smaller messy pieces in your garden, creating unnecessary long-term maintenance. 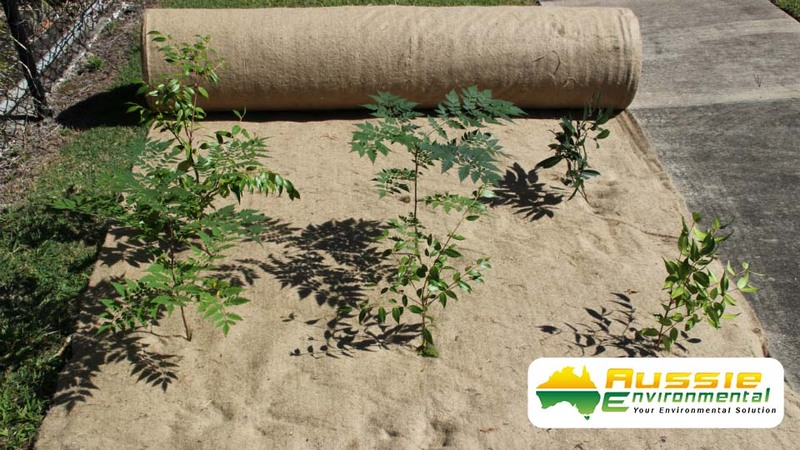 Jute based weed suppression products can be placed under mulch or over the top of existing cover while being used as an erosion control blanket and weed suppression. Jute matting will last around 12-18 months until it start to break down. Have you ever heard of the term plant totem? Plant totems are sometimes called Philodendron totems or coco totems and are a plant support for a range of climbing plants but are generally made for the following plant species – Philodendron, Monstera and Pothos plants species. These plants are a great indoor plant as they climb high around the poles while using minimal pot and soil space. 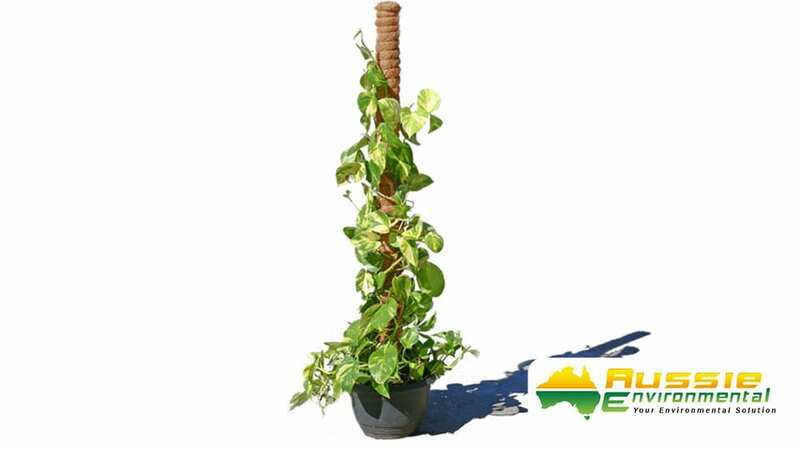 Aussie Environmental are the largest supplier in Australia of plant totem poles and are available in a range of sizes from 40cm tall all the way up to 150cm for your larger climbing plants. 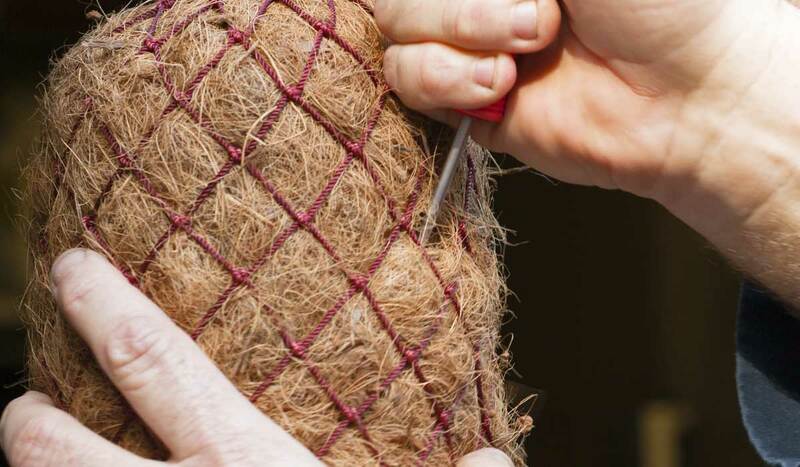 Our plant totems are made with coir fibre which enables the roots of the plant to grip into the natural organic fibres and not just on the side as opposed to using a wooden pole. 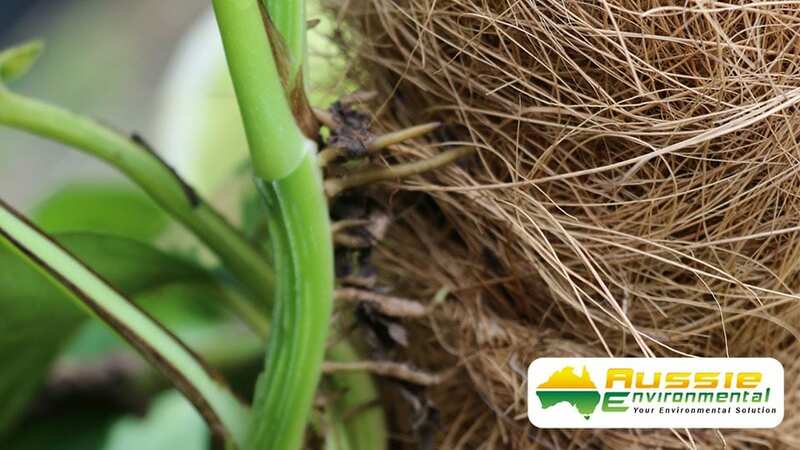 Our mini coir logs are a great product for creating a hanging bromeliad garden, but we get a lot of people asking on what’s the best way to attach your bromeliads to our mini coir logs. 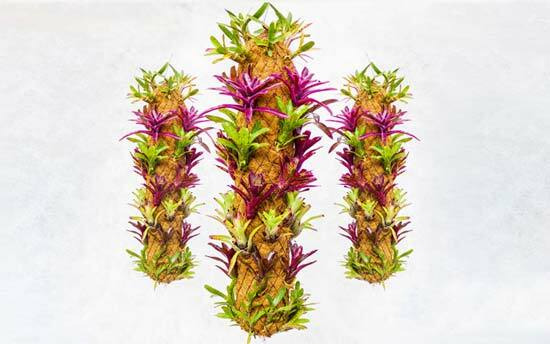 So here is a step by step guide for attaching bromeliads to your mini coir log. Seasol, Zip ties or twine, Scissors and a Screw driver. 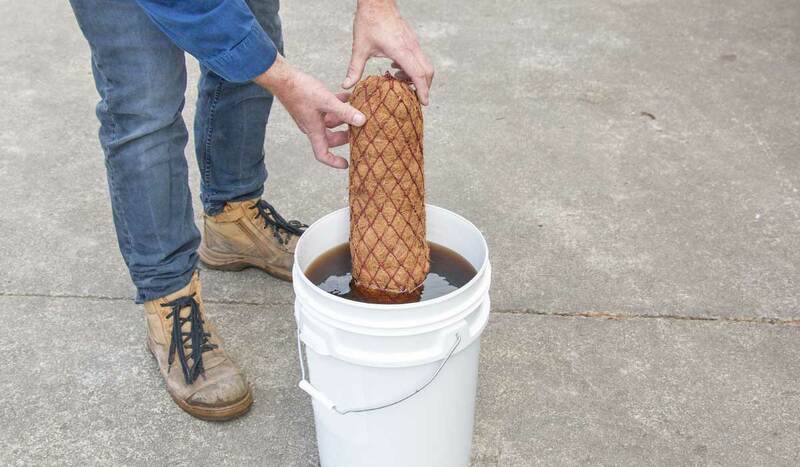 Pre-soak the mini coir log in a solution of seasol and water for about 2 hours, this makes it easier to insert the bromeliad pups into the mini coir log. 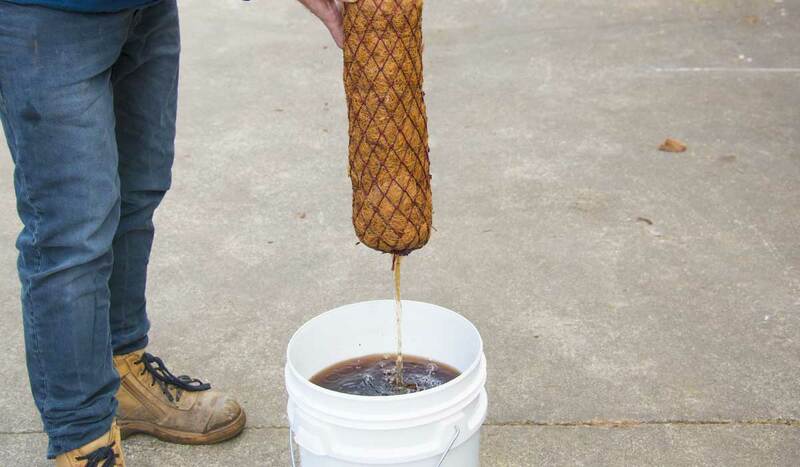 Once the mini coir log has been soak you will need to drain the seasol and water solution. Using your screw driver create holes at a 45 degree angle into the mini coir log to where you would like your bromeliad pups to grow. Creating a angled hole allows the plants to be attached in an upright position, this prevents the plants from sagging and also provides the root system with a stable base. 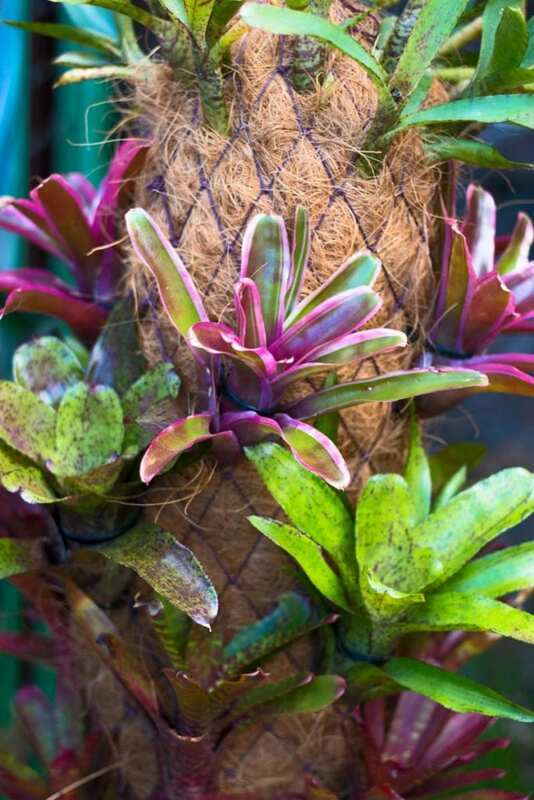 Water the roots of your bromeliad and remove any excessive amount of soil from around the base of your bromeliad pup so it can easily fit into the hole created. The plant should be facing in an upright position ready to be attached to the mini coir log. 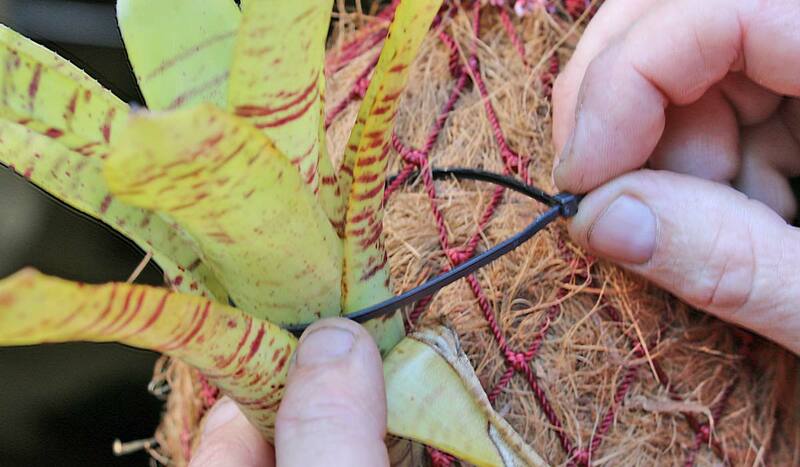 Using your zip ties or twine to secure the pups near the base making sure the bromeliad are attached facing upright (vertically). 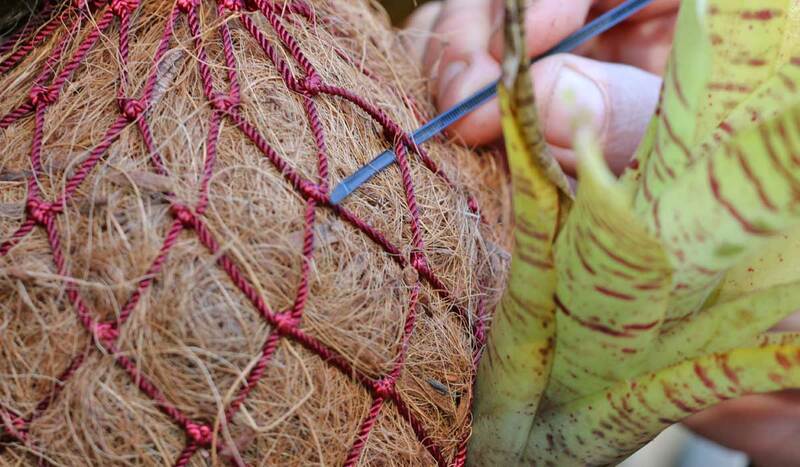 To do this you need to insert your zip tie / twine into the nylon netting above the bromeliad (see image 1. 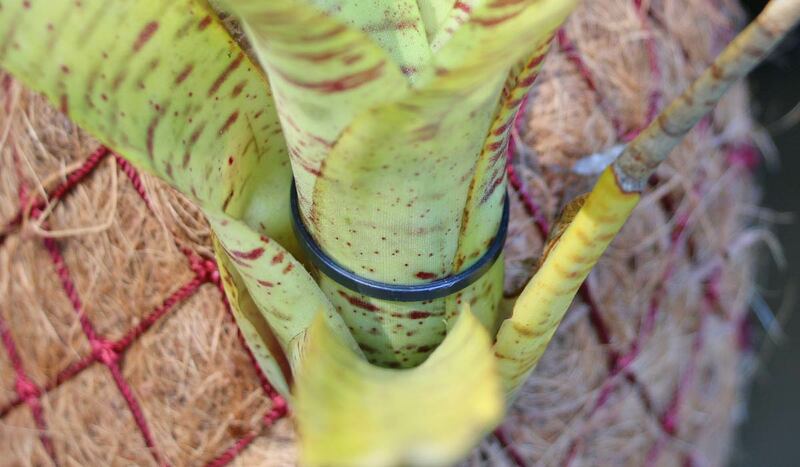 ), then wrap the zip tie / twine around the trunk of the inner flower of the bromeliad plant and secure the bromeliad vertically to the Mini Coir Log (see image 2). 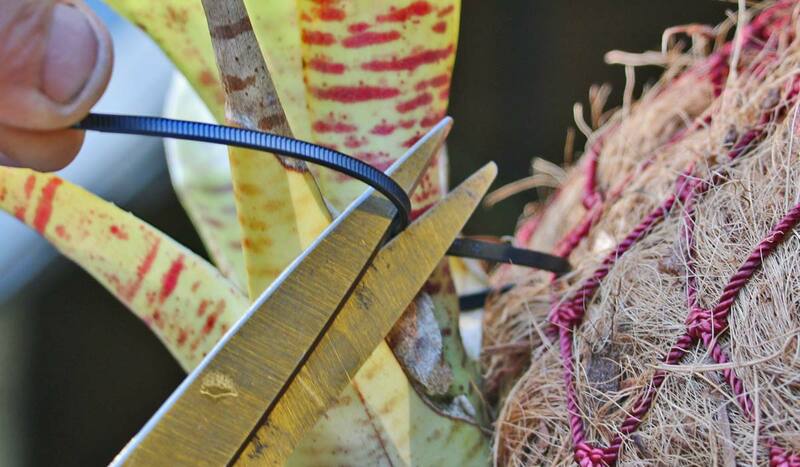 Cut off any excess plastic or twine and make sure the plant is secured upright so the bromeliads can grow without sagging and to provide better drainage for the root system. Bromeliads will hold water in its tank (the centre of the plant). Water the tank and try to keeping it full with water. Do not keep stagnate water in the tanks making sure there is new clean water being replaced on a regular basis. 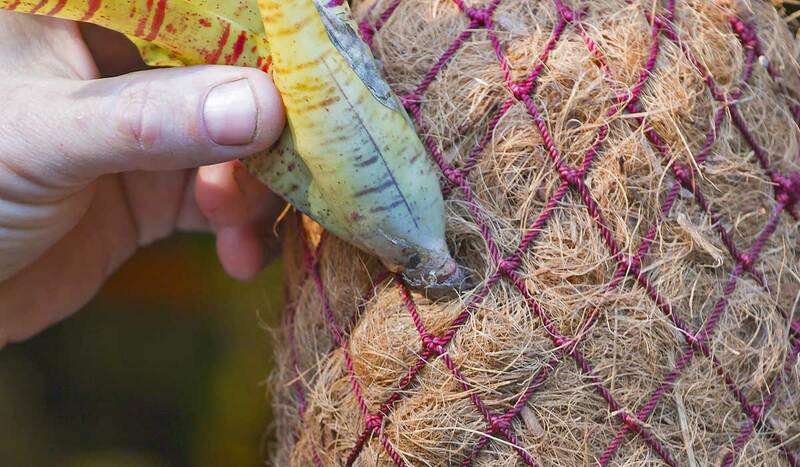 Try to avoid direct sunlight when hanging your mini coir log, too much sun light can cause leaf burn to the bromeliads.